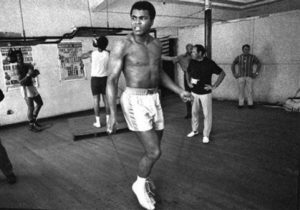 At some point in all our lives we’ve picked up a skipping rope and jumped over it. Maybe in the playground or in the gym. For play or a serious fitness workout. With a group of friends or on our own. Invariably in time to a musical beat or song. We’ve seen boxers do it in training. 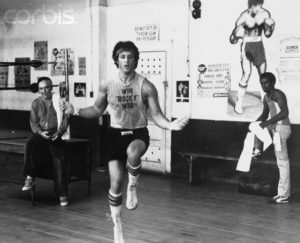 Sylvester Stallone as Rocky Balboa (1979) training for a heavy weight title fight. Indeed some have taken it a few jumps further, to pursue the international sport of jump rope, competing in timed speed and freestyle events. 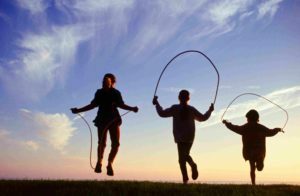 There are few discussions about the cultural significance of jump rope and people still raise their eyebrows when it is introduced to them as a competitive sport – though once they see the athletic prowess required, they don’t question its validity. Fox Sports has been slow to catch on. 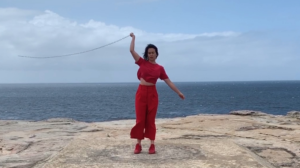 Artist Amrita Hepi has shaken up the status quo and taken skipping as far as she can, using the mechanics, the associations and metaphors for skipping and the rope as the basis for her latest work – The Pace. Hepi is a Bundjulung (Aus) and Ngapuhi (NZ) woman whose evoloving career is on an upward trajectory. Trained and respected as a dancer and choreographer, Hepi’s practice embraces other disciplines – film, performance, sculpture, and public engagement and participation. She uses these to explore her main interests around authenticity, contemporary manifestations of traditional culture and lore, and the politics of race and gender. 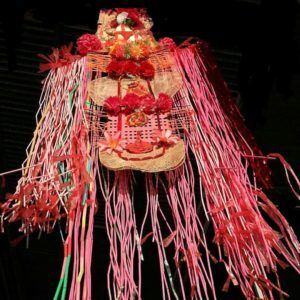 The connecting thread to all her work remains the body – how movement and dance are conceived from, and then become, the creative expressions of an individual’s or communities’ histories and identities. Embedded in thoughtful gestures and movements, be they spontaneous or well-practised, are a wealth of personal and collective stories. Amrita Hepi. Image from her performance Caltex Spectrum for the 2018 Keir Choreographic Awards. Winner Audience Choice Award. 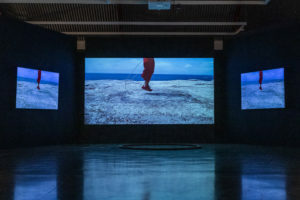 The Pace is a 3 channel video installation which uses archival and recent footage of skipping and its quintessential elements – the rope, the jump and the beat – to recognise its broader social and cultural history, and introduce a different symbolism. 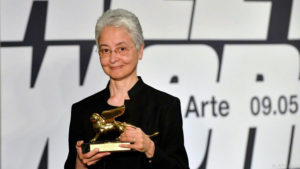 Whilst we’re held in awe of the physical demands of the jumping, twisting, turning, landing body, as play or serious sport, it is presented by Hepi as another form of choreography – another opportunity for her to use the body and movement as a means to express stories of culture, knowledge and tradition. There are outbursts of great joy and energy, as large and small groups, work to achieve that sublime moment of being truly in sync. There are tougher scenes of political protests meeting with police violence. There is the beautiful meditative moment of the solo dancer, slowly jumping on the cliff top against the backdrop of the sea. 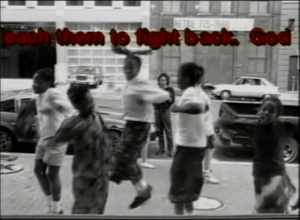 Jump rope can tell us of the histories of young African-American and Indigenous girls. How they played together, jumping in time to chants that spoke of age-old lessons and stories, collectively enjoying the beat and sense of freedom. It was playing outside any codified or structured framework or ritual: it was part of, and became an expression of, everyday life. 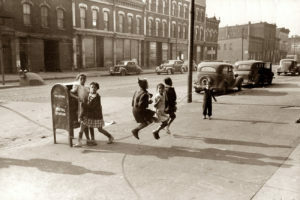 Children jumping rope on the pavement of a south side Chicago street. April 1941. Shorpy Historic Picture Archives. Evanston School children lesson learning. c1900. 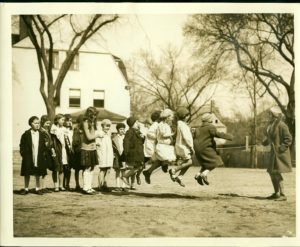 As a relatively little known competitive sport, jump rope tests the physical strength and agility, commitment and a fearlessness to keep beyond the rope at speed, in the air, doing cartwheels or backflips with or without a team member, as it is crossed, turned or flung. Interspersed throughout The Pace with imagery of the-jumping-bodies-through-the-turning-ropes are ropes of other kinds: spider’s webs, chains, hair braids, threads for weaving, life lines, safety lines, umbilical cords and intravenous lines. 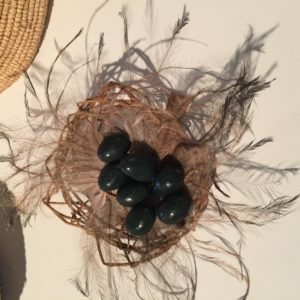 All of which become metaphors for the ties that bind, hold, capture, connect, nourish, tether and weave different life experiences together, as interpreted through the eyes and insights of this young Indigenous female artist. How long is a piece of string? As far as Hepi wants to take it. Hepi claims a synergy between the collective activity of turning the rope, be it for sport or play, with that of the weaving traditions of Indigenous women. 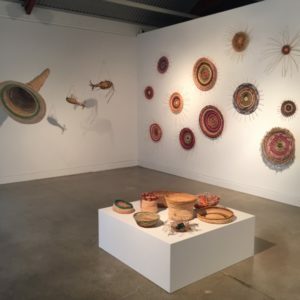 And to affirm this connection, alongside her video, is an exhibition of beautiful weavings by the Yirran Miigaydhu group (‘many women weavers’), which meets at the Campbelltown Arts Centre each month to weave together. As they weave grasses together, they exchange stories and issues facing their respective communities, connecting to culture and language. 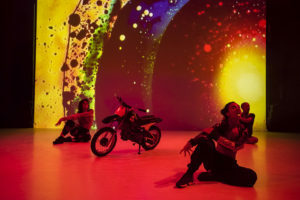 The Pace was commissioned by Cement Fondu (Sydney) and The Lock Up (Newcastle) and is now showing in association with Sydney Festival 2019. The Lock Up is an independent multidisciplinary contemporary arts space in central Newcastle. 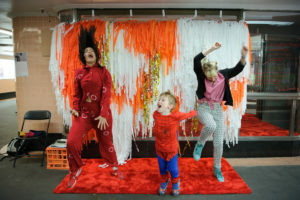 As its name suggests The Lock Up was a police station which has been transformed into an independent creative hub, featuring artists working across experimental and multidisciplinary art forms. Don’t believe anyone who suggests that if you live outside inner Sydney, you’re missing out! Those days are long gone. Based in Paddington, Cement Fondu is the phoenix which arose from the closure of Stills Gallery, the contemporary art photography gallery of great note. Since opening in 2018, Cement Fondu has presented an ambitious program of multi-art form exhibitions, performances, public workshops and artist residencies, working with national and international artists. Pairing early career Australian artists with esteemed international artists is an ambitious feature of Cement Fondu’s annual program. The first iteration was Sense, in which French-born, Belgium-based Laure Prouvost’s video work was presented in tandem with a newly commissioned installation and live work by Sydney-based artist Emily Parsons-Lord. Prouvost won the highly prestigious Turner Prize in 2013 and will represent France in the upcoming 2019 Venice Biennale. Cement Fondu’s international reach has serious muscle and brings great energy to the Sydney art scene. To co-incide with this Sydney Festival is the second iteration of the national/ international pairings at Cement Fondu. 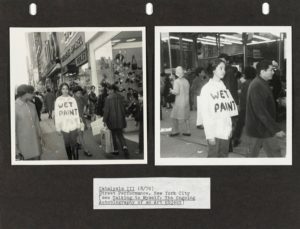 Alongside Amrita’s video work are three videos by leading international conceptual artist and philosopher Adrian Piper, which, together, extend the discussion around truth in histories as it pertains to women of colour. Piper’s work reflects her own African-American heritage within a feminist tradition, which she has been pursuing since the late 60s/ early 70s, in her student days in New York. Known for her uncompromising and fiercely independent approach, Piper’s influential work has directly addressed gender, race, xenophobia, and, more recently, social engagement and self-transcendence. 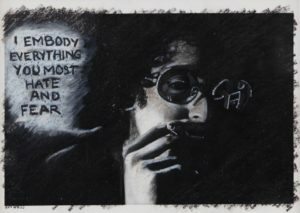 Adrian Piper The Mythic Being: I Embody Everything You Most Hate and Fear 1975, oil crayon on gelatin silver print. Image courtesy Adrian Piper and the APRF, Berlin. 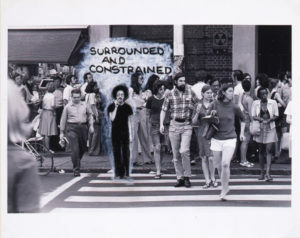 Adrian Piper, I am the Locus (#2), 1975, oil crayon drawing on photograph. Though Piper has exhibited in Australia before, in a collaborative project with Brenda L. Croft, Gurindji/Malngin/Mudpurra artist, curator and academic, in the 9th Biennale of Sydney: The Boundary Rider curated by Tony Bond, I imagine it is nonetheless quite a coup for these local commissioning galleries to present her work. Her work in Sydney currently includes three older videos all of which, though seemingly documentary in style, possess a deeply thoughtful and personal honesty. There is great emotion in these works which is perhaps not the response much conceptual art seeks. Presented as a silent disco – a fab current fad where everyone wears headphones with a selection of different music tracks from which to choose, then dances solo and in overall silence – you put on your headphones, click to the soundtrack associated with the video, and watch and listen and be moved – emotionally and physically. 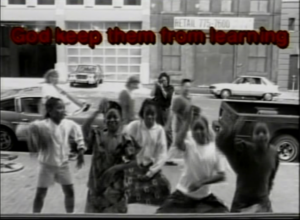 The poignancy of the moving video Please, God from 1991 in which your heart swells with the sheer joy of watching young African-American girls innocently dance in front of a shop window, obviously watching something on a display TV. You feel the age of the times – the fashion, the cars driving past, it’s in B&W – and the darkness of the times: with overlaid scrolling text as simple prayers starting with “Please, God….”, as a glimpse into a future of discrimination these gorgeous happy girls will come up against. 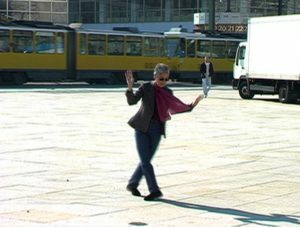 Adrian Moves to Berlin (and she does live in Berlin) is more recent and is an hour of Adrian dancing continuously and alone, to music, in AlexanderPlatz in Berlin. She eschews a wonderful sense of freedom by just moving to the groove in public, on her own, with confidence and intent, and without stopping. Piper is interested in how dance can be both about protest and celebration. She found that, following the collapse of the Berlin Wall, people sought new ways in which to come together as a united community – dance was one of the ways. 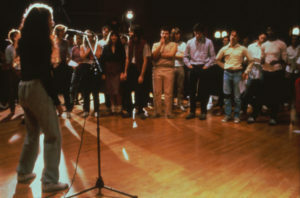 Then head on upstairs with your headphones to watch what is probably Piper’s most well-known of videos: Funk Lessons (1983-84) in which Piper is filmed giving ‘funk’ history classes to a group of students at UC Berkeley – though with an agenda. She asks of the students to listen and dance to funk music. In so doing, she is asking them to think about the origins of funk music and who may be the true champions of a style of music which had a massive and enduring influence on culture and music throughout the 20th century. Are these champions household names? Or was it their followers who were picked up and promoted by the mainstream white impresarios? There are many threads in this paired exhibition, connecting the practices of these two women. The video format works really well: enjoy the luxury of watching each gesture, stance or jump, over and over, to absorb every nuance and subtlety. Both have filmed and presented epic dances, choreographed from everyday life, which are celebratory, provocative, emotional, optimistic and, above all, meaningful. 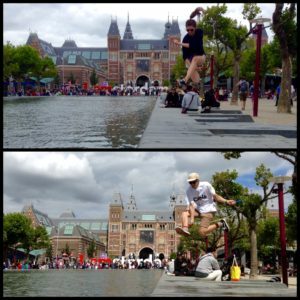 Jump to it! It’s a must see. Cement Fondu 36 Gosbell St Paddington. On until 24 February 2019.